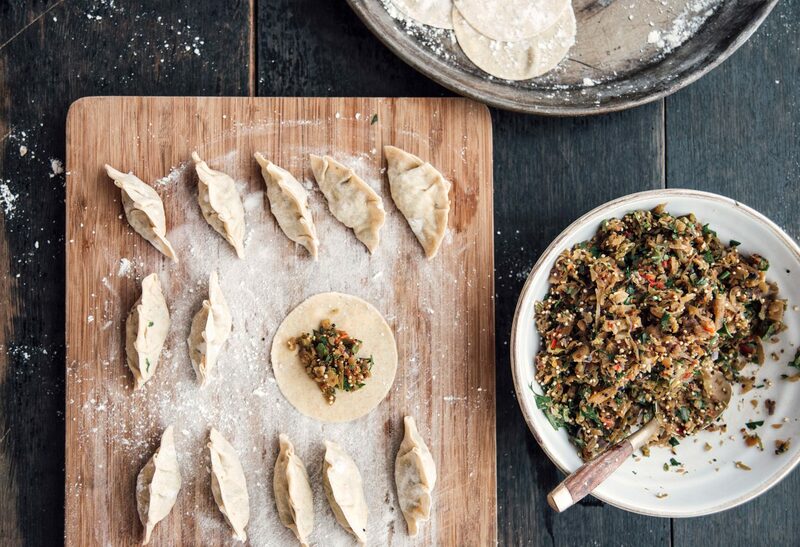 Gyoza, otherwise known as ‘pot stickers’, are traditional Chinese dumplings that have become very popular in Japan. After a bit of practice, these are quick and simple to make. Gyoza or ‘gow gee’ wrappers are round and white rather than yellow like won ton wrappers, and can be found in most supermarkets. 2. If using the food processor to finely chop the ingredients, use a clean towel to gently squeeze the mixture to remove excess moisture. 3. Transfer vegetable mixture to the large bowl and mix in the water chestnuts, cornflour, soy sauce, sesame oil, salt, sugar and white pepper. 4. Place a teaspoon of the filling in the centre of each gyoza skin. Moisten one edge with water, then fold the opposite edge over and press down to seal the gyoza into a neat crescent. 5. Heat the frying pan over medium heat, then add 1 teaspoon of sunflower oil. Place some of the dumplings in the pan (don’t overcrowd, they should not be touching) and cook for 2 minutes over low heat until just beginning to brown. 9. To make the gyoza sauce, place the sugar and vinegar in the small pot over a low heat and stir until sugar is dissolved. Combine all of the ingredients together, mix well and allow to cool before serving.